In Browser Chrome by Google or Firefox and Thunderbird by Mozilla you can per default configure only the setting for one internet connection. If you liked to use once a direct connection or different proxy configurations, then the dialog "Connection Settings" has respectively to be executed newly. With the ProxySwitch you can manage different configurations and simply switch over between these. The following documentation describes the complete range of functions. The extension contains the appropriate documentation. From Firefox 57, the previously used native interface (XUL) has been omitted, this caused a complete reprogramming with the new interface WebExtension of Firefox. This interface does not yet contain all previous functions. Therefore, in the extension ProxySwitch for WebExtension the affected function is removed first. By default, the Chrome browser uses the system settings for proxy configuration. The extension does not use the system settings for Chrome, but the settings specified in the extension. Other programs still use the system settings for access to the Internet. Required for the basic function of the ProxySwitch. Required for the function clear=cache. This deletes the cache of the browser. Required for the function Automatic switching (testUrl), to check the reachability of a user specified URL. This is implemented via a head request to the server. 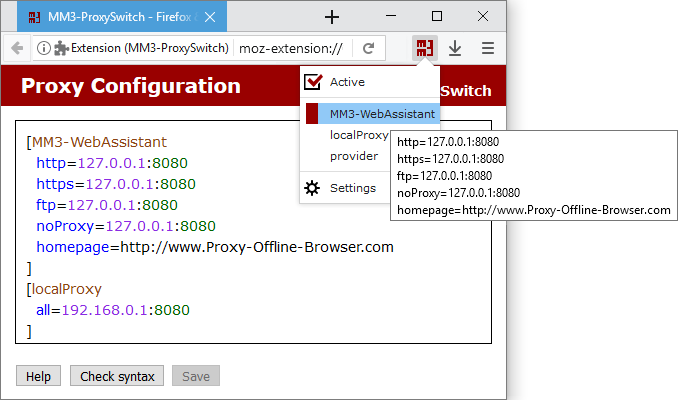 With one click on the symbol ProxySwitch you can switch between the direct connection to the internet and a proxy configuration. The name of the used configuration is displayed. You can select a proxy configuration from the popup menu. You can edit the proxy configurations with the menu Settings. Every configuration has a definite name and starts with the opening bracket [ and ends with the closing bracket ]. This name of the proxy configuration is displayed in the popup menu. The both brackets [ and ] as well as every keyword must be in a new line. According to the structure in the following example. Enter the proxy for any required protocol. The same proxy is used for the protocols http, https and ftp. For the given domains the proxy shall not be used. Several domains are separated by a comma. This corresponds to the syntax of Firefox. URL to the script for the automatic proxy configuration. With the parameter reload the script is loaded newly when switching. The following two proxy configurations are predefined. These can be extended with additional settings. Auto-detect proxy settings for this network. When switching over the proxy configuration a other homepage can be displayed. To this you indicate the homepage at the respective proxy configuration with the keyword homepage. Before you use the Offline Browser WebAssistant - Proxy Offline Browser, the cache of your browser should be deleted. With the keyword clear this is carried out automatically. The first four proxy configurations are activated or switched over. An individual assignment of shortcuts by users does not provide WebExtension. If another extension already uses the same shortcuts, you have to decide which extension should use these shortcuts. In that case, delete both extensions and install the extension first, which should use the hotkeys. If you select a proxy configuration, then this is immediately used per default. With active=no the select configuration is entered. The direct connection to the internet is used, however. This is obvious if you use the automation of the proxy configuration and you don't need a proxy at every location. The keyword symbol can be used to change the representation for a proxy configuration. This allows each active proxy configuration or a direct Internet connection to be displayed differently. Color value must be specified according to HTML or CSS syntax. The keywords can be defined inside and outside a proxy configuration; within, the keywords apply only to this proxy configuration. For a direct Internet connection, the symbol is always displayed in "black" (#000). If the proxy configuration MM3-WebAssistant is activated, the symbol MM3 is displayed "green". If the proxy configuration Company is selected, the symbol is displayed as a square. If Company is then activated, the color changes from "black" to "blue". Lines can be marked as comment lines. These lines can only contain comments. The keyword proxyDNS controls whether DNS lookups for SOCKS version 5 clients happen on the client or on the proxy server. With the value true the proxy server perform DNS lookups. With the Chrome browser, the proxy server always requests the DNS, so the keyword is omitted. If you use different networks with your laptop computer, then the required configuration can be determined automatically. There are two possibilities for it. Starting the Firefox it is checked whether an URL is available. Into dependence of this test the direct connection to the Internet or the proxy is used. Check is executed if you activate in the Firefox: Direct connection to the Internet. Check is only executed if a proxy configuration is activated. If in the test the URL is available, the proxy configuration is used. The testUrl can be noted inside and outside a proxy configuration; for inside, the testUrl only applies to this proxy configuration. The availability of the WebAssistant - Proxy Offline Browser is checked here. If this proxy has started, then this is used. The IP address used currently determines the matching proxy configuration from several deposited entries. The respective IP address is the name of the proxy configuration. If you need an area of IP addresses, then you indicate only the constant part with that the IP address starts. This configuration is used, if nones of the given IPs are found. You see the used syntax at the following example. The entry import=IP activates this function so that at every restart of the Firefox the matching proxy configuration is used. If your computer binds several IPs at the same time, the order of the configurations is importance. The search for a matching IP starts with the last configuration. If your Internet Explorer is already configured automatically into dependence of your network environment, then you can use this configuration also in the Firefox. Now every restart of the Firefox imports the active proxy configuration of the Internet Explorer. Function is only available in the Firefox (version 1.5 and higher) for Windows. Would you like to change further preferences at switching of the proxy configuration? You set these to the keyword config: and a preference (name=value) at the respective proxy configuration. The preference name network.proxy.​socks_remote_dns controls whether DNS lookups for SOCKS v5 clients happen on the client or on the proxy server. With the value true the proxy server perform DNS lookups. If you liked to assign a standard setting to a keyword, then you give this pre-allocation after the last closing bracket ]. The type can be formed with CSS syntax for font, size, color, background etc. In the editor the text is displayed with a monospace font. You would like to save web pages and use these offline? The ProxySwitch completes ideally the WebAssistant - Proxy Offline Browser. With the WebAssistant you click a link and the page is shown as normal, also adds the page to an archive on your hard disk enabling offline access, bookmarking and searching.